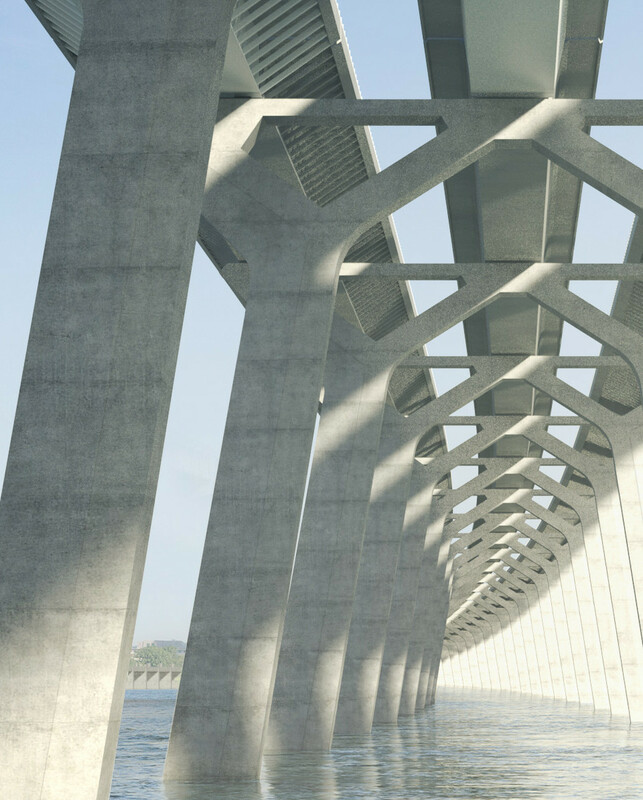 Since the announcement of the New Champlain Bridge Corridor Project, various stakeholders have expressed their expectations regarding the architectural quality of the new bridge and the corridor as a whole. To provide the Montreal area with a signature bridge, the Government of Canada innovated while complying with the usual Canadian supply framework in public-private partnerships. In the summer of 2013, steps were taken, together with the City of Montreal, to assess various options for ensuring the architectural quality of the new bridge. The federal government, in keeping with this approach, selected the prescribed design model, with the shape and/or geometry of the new bridge’s essential architectural components illustrated to ensure architectural quality while leaving the private partners enough flexibility to innovate. The Government of Canada retained the services of Arup, a consulting engineering firm, which brought in the services of the firms Dissing+Weitling and Provencher Roy to develop the shape and geometry of the new bridge. An architectural review committee, made up of local experts in architecture and design, was also established with a mandate to advise on setting priorities for project components that require special attention in terms of architectural quality as well as to advise on the solutions being considered. As a result, the new Champlain Bridge corridor was designed as a world-class initiative with a visual identity contributing positively to its status as the main gateway to Montreal. This reflects the values of the local community while respecting the environmental context of which it is part. With the bridge project now in the implementation phase, the Government of Canada and Signature on the Saint Lawrence are working closely with the various stakeholders to ensure alignment of the project’s design and implementation phases from an architectural standpoint on the one hand, and, contribution to the success of the project’s integration with its urban setting on the other.